In far North-Eastern India, the power of nature is not a limitation, but a resource. This video offers a glimpse at an old tradition, but one that’s very much alive – in more ways than one! The root bridges, some of which are over a hundred feet long, take ten to fifteen years to become fully functional, but they’re extraordinarily strong – strong enough that some of them can support the weight of fifty or more people at a time. 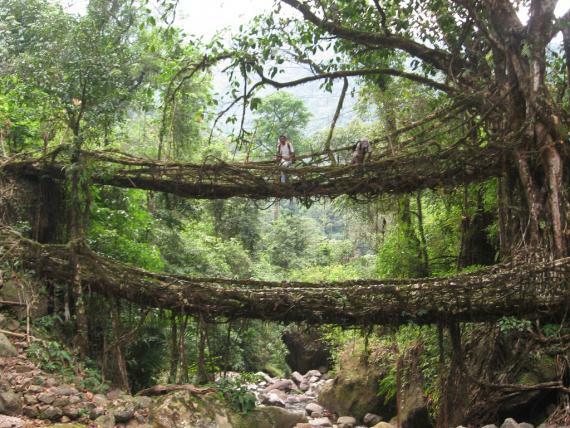 In fact, because they are alive and still growing, the bridges actually gain strength over time – and some of the ancient root bridges used daily by the people of the villages around Cherrapunji may be well over 500 years old. For more photographs of these living bridges, check out Atlas Obscura’s webpage!